The Safe and Secure wireless security system provides remote monitoring and control of security/electric devices and the ability for a customer to use a computer or smartphone to interact with the system and use SMS and email commands to control the system. It also provides information on energy consumption, empowering users to be energy efficient. The Engineering Academy at British Gas wanted us provide a training solution for the Safe and Secure wireless security system. 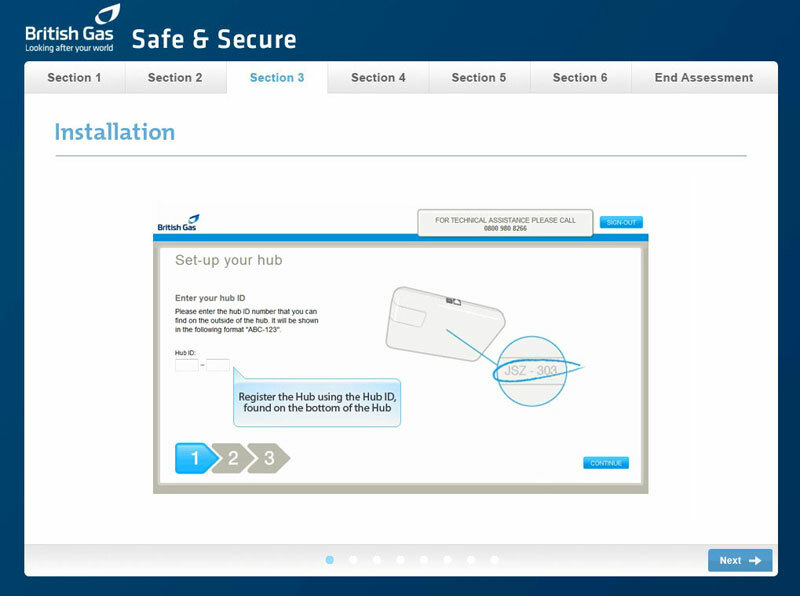 The training needed to be designed to ensure engineers had the knowledge and competence to carry out installations, troubleshoot common issues, understand how all the components work and be able to demonstrate the online Safe and Secure website to customers before being sent out ‘into the field’. We used Adobe Captivate to produce the training. This allowed us to create a training solution that incorporated guided walkthroughs for engineers explaining how the Safe and Secure website worked and how to alter settings through the website. It also provided important information on how to set up the hub and sensors around a customer’s home. At the end of each section the engineer is required to take an assessment to check that they have understood the information given to them. As retention of the knowledge is critical to the engineer they are required to pass the assessment for each section before they can move onto the next section.